Digital imaging in medicine has gone through huge developments. This has also improved the planning in dentistry. Thanks to CBCT scans we are able to detect even more complex problems and minimise the risks of unnoticed pathologies. It is very useful for regular controls and preventional examinations. How does a CT work? The examination takes about 40-60 seconds, where the patient is sitting comfortably. 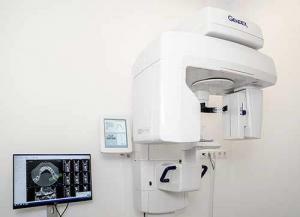 The machine itself is very similar to the panoramic x-ray machine. Unlike an MRI scan, the patients don’t have to squeeze themselves in a tube and feel claustrophobic. The CBCT depicts a cone shaped slice of the body. The scan rotates in 360 degrees and combines the pictures taken on the orbit into one 3 dimensional picture. This image is more correct than a traditional panoramic x-ray which tends to distort the picture. These CT scans are punctual to the tenth of a millimeter. It is also a type of radiologic examination but compared to the traditional CT scan, it only uses 1% of the dosage it used to. Since it takes images in a cone shape, the single pictures are not overlapping and therefore it has to take less pictures which means smaller radiation. There is no need for films, chemicals because all the information is gathered on a digital sensor and the single images are combined by the computer to a 3 dimensional result. The most important question: when should we use it? This question is difficult to address because it makes detecting so many problems much easier, also we don’t have to face any surprises during operation (real dimensions of bone). In case of an extraction or removal of a wisdom tooth we can avoid the rupture of nerves and vessels by depicting and locating them previously. A piece of a root or any foreign body is easily detectable as well. A CT also helps to select those teeth not affected by periodontal disease so we can guarantee the bridge or crowns that are being planned will hold for a long time. The most important feature of these images is the possibility to measure the density of the bone and shows us the exact topography of the trabeculae. This can contribute to more thorough implant positioning and exact bone augmentation. We can even measure the thickness of the floor of the maxillary sinus. While we can see the more dense parts of the hard tissues, we can also get a glimpse of existing inflammations, which can cause the excess hair fall or even joint problems. In case of a recurring sinusitis it’s easier to differentiate whether it’s of dental or nasal origin. We can observe the tissues surrounding the roots of the upper teeth. It has a major role in more complicated cases like TMJ-problems (Temporo-mandibular joint). The movements, the malfunctions can all be depicted and observed with this method.